Our Mission The Pediatric Urology Nurses & Specialists and Associates is a professional organization dedicated to improving the care of pediatric urology patients across the lifespan through educational programs, research collaboration, and evidence based clinical practice. "You Taking Care of You: A Girl's Guide to Using a Catheter"
"You Taking Care of You: A Boy's Guide to Using a Catheter"
PUNS is pleased to have several Special Interest Groups available to members. The SIGS focus on various aspects of our specialty and can be viewed by logging in to the Members Only Area. 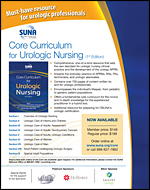 Comprehensive, one-of-a-kind resource that sets the new standard for urologic nursing clinical practice and the development of the urology APRN. Impacts the everyday practice of APRNs, RNs, PAs, technicians, and urologic associates. Contains over 700 pages of content written by and for urologic professionals. Encompasses the individual's lifespan, from pediatric to geriatric patient populations. Offers a dundamental core curriculum for the novice and in-depth knowledge for the experiences practitioner in a hybrid text. Additional resource for preparing for CBUNA's urologic certification.